Home › Pix of the Trade › Fast & Furious at Universal! Fast & Furious at Universal! Superstars from the Fast & Furious franchise – star and producer Vin Diesel (Dom), and stars Chris “Ludacris” Bridges (Tej), Tyrese Gibson (Roman) and Jordana Brewster (Mia) – celebrated the opening of Universal Orlando Resort’s new attraction, Fast & Furious – Supercharged, yesterday (May 2). 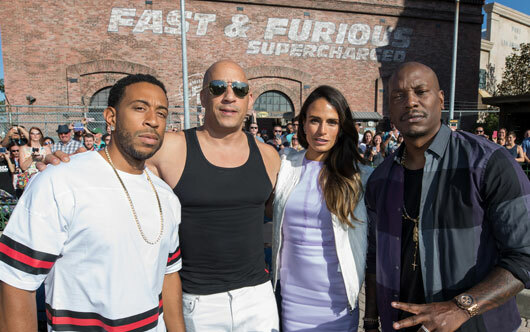 Diesel joined some of his Fast & Furious series co-stars for a celebratory moment reminiscent of the Fast & Furious films – featuring high-speed car action and an amazing stunt in front of the attraction. The moment culminated with a countdown led by the franchise’s superstars and an explosive pyrotechnics display.